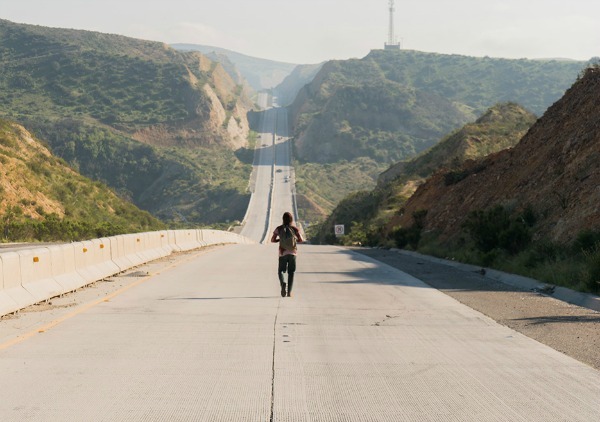 Solo in Mexico, Nick faces personal demons and fights to find himself while staying alive in this stand-alone episode of Fear The Walking Dead. Our return to Mexico has shed some light on the gentle soul of Nick. After deciding not to leave the Abigail estate with his family, he spends days looking for shelter and water. The few people he encountered along the way were suspicious, scared and hostile. He finds kindness in the home of a woman, Sofia (Diana Lein) and her son, Juan (Moisses Arath Leyva). She’s leaving to find Juan’s father (likely a really bad idea) and supplies Nick with some food and water before they part ways. Sofia advises Nick to head for the mountains. He wanders miles of deserted road, scavenging what he can from abandoned cars. He finds shelter in an empty house, lights a fire and falls asleep, dreaming about one of his court-mandated stays in rehab. In the dream there’s a girl, and she was able to get him to talk about his father. Nick was so angry with his father he could barely speak. He eventually says that his dad came home every night, but wasn’t really there for the family. He spent most of his time at home holed-up in his office, though Nick really needed him. These wounds are still fresh. Who was supposed to show Nick how to be a man? My heart breaks for him, even dreaming, he seems to be holding so much inside. His dream is interrupted by a Spanish-screaming, baseball bat-wielding woman, who chases him into the night. Guess not everyone’s a fan of Nick’s gore-suit. Food and water soon run out that next day, and the highway is a long and hot. As night falls, a shivering Nick drifts off and dreams of rehab again, and the terrible day Maddie came to tell him his father was killed in a head-on collision. Nick was brokenhearted. Two barking wild dogs are Nick’s wake-up call this time, and he’s bitten on the leg before climbing on top of a small bus. A large herd of the infected is drawn to the sound of the dogs. Also approaching is a vehicle full of hoots, hollers and gunfire. It’s a band of Outlaws — the infected are their sport. The herd turns toward the Jeep. Nick snags a belt from a passing walker to use as a tourniquet and blends into the herd. The undead continue toward the noise of gunshots. Nick’s cover is blown once he locks eyes with one of the men. He limps into the hills, dodging bullets. The dogs are a tasty snack for the remainder of the herd, as are some of the unlucky Outlaws. Sunburned and dehydrated, the sun beats down on Nick and the thorns of the cacti join in the assault. He tries to get water from a piece of cactus by eating it. It sickens him, so he instead opts for an Idi Amin cocktail of his own urine. Maybe Nick’s will to live is much stronger than we thought. As he walks with the herd again, he begins to hallucinate, and some of the infected turn into familiar faces. They speak to him and confuse him. A group of Lookouts watch this from a distant hilltop, and see Nick through their binoculars. It’s clear he’s not one of the infected, but they don’t know what to make of him. His last ounce of energy gone, Nick collapses on the road. Unconscious, Nick flashes back to his time in LA with Gloria (Lexi Johnson). They’re in the church, and Nick is reading her passages from a book he’s reading, Winesburg, Ohio. She promises him she’ll read it the next day, but we know that day never came. A drenching rain revives Nick and literally saves his life. He manages to make his way to a small town, now called “El Colonio. It’s full of survivors trying to make sense of the new world. He meets Alejandro (Paul Calderone), formerly the town pharmacist, now the town doctor. He cleans and dresses the dog bite, but Nick is morose. His will to stay alive is broken. He tells Alejandro he wants to be “where the dead aren’t monsters.” Still, it seems Nick may have found a home, at least for now. Once he steps outside into the courtyard, he sees children laughing and kicking a soccer ball. The ball rolls over to him, and he kicks it back gently. He smiles that beautiful smile. I think this has been Nick’s first smile in a long time.